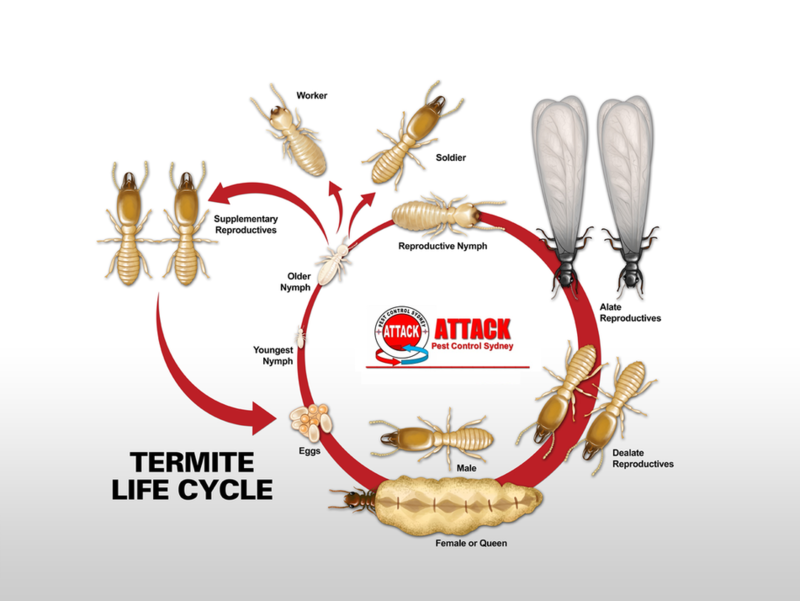 Attack Pest Control Sydney provide Termite barrier protection spray, we use chemicals registered for 10 years protection for termite pre construction purposes. We use high quality chemicals that is registered for 10 years protection. Your Satisfaction is our goal. If you aren't completely satisfied, we will work with you until you are. If pests return between treatments, our technician will return at no extra charge. And if we are unable to solve the problem a 100% money back guaranteed. More importantly, you can call us at anytime if you have a problem and we will work to solve it. After the fertilized queen lays her eggs, they hatch into pale white larvae. Over the course of several molts, these larvae grow to assume a role in one of the three termite colony castes: workers, soldiers and reproductive termites, also known as alates. Each caste has a distinctly different physical appearance. Workers are responsible for constructing tunnels and chambers as well as feeding and grooming other termite castes. Soldier termites are yellow-brown in color, with dramatically enlarged heads and often large mandibles. These are useful in combat but render warriors incapable of feeding themselves. The reproductive alates are darker in color and are born with two pairs of wings. Although it is not clear how larvae are relegated to a certain caste, some research has indicated that maturity and the overall needs of the colony may dictate caste assignment. In fact, research has indicated that castes in the termite life cycle are not rigidly set, as termites belonging to one caste may develop into another caste if the colony requires it. Thus, a soldier termite may become a worker or a reproductive termite if the colony experiences a shortage of one or the other. ATTACK Pest Control Sydney's technicians are skilled, extensively trained and experienced professionals.